Aerial Views of Japan : Blog Of The Nation The race to find survivors along Japan's coast is underway. The New York Times used aerial photos from before the earthquake and tsunami, and immediately following to show the destruction. Users can slide a tab to compare. 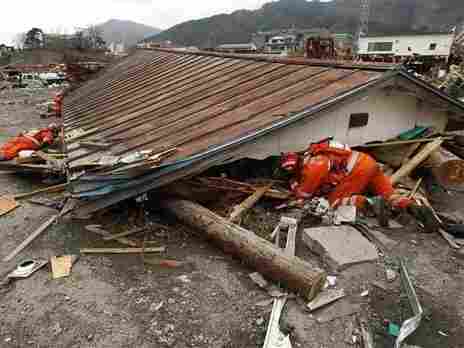 Seemingly every hour, I flip through the major newspapers looking for photos of the destruction in Japan. Hopefully it's not gawking at a train accident. I'm constantly wowed by the destruction, but also by the successful use of aerial photography. This industry, along with remote sensing, geographic information systems and advances in mapping, has propelled journalism to new levels. This feature from The New York Times shows the before-and-after photos from cities along Japan's east coast. These are no HG-TV before-and-afters: Entire neighborhoods in the Iwaki photos are completely razed, swaths of trees in the Kakuda photo appear uprooted, and the farm land is completely under water in Natori. If you're like me, you'll spend considerable time sliding those photos from before, sadly, to after. Here's hoping these tools that journalism has recently discovered will help in the recovery.